It's been a funny old season – and the first one without the always threatening race presence of Belgian legend Sven Nys. Yet in many ways this winter has mirrored the 2015-16 professional cyclocross season in that two young riders – reigning World champion Wout Van Aert and Mathieu van der Poel, the Dutchman he dethroned eleven months ago – stand pretty much head and shoulders above their peers. Trading blows like two prize fighters, attacking early or pressurising and forcing the other into making a mistake, it's been a fascinating winter despite knee surgery delaying Van der Poel's start to the season until October (as, in fact, it did last season). Current form suggests that Van der Poel is fully recovered from the surgery at the end of the summer (to prevent further knee problems), but is it something that could rear its head again? "No it's OK," Mathieu tells me, "When I run too much then I feel it, but it's not really a problem, it always goes away afterwards. I crashed on it (a previous injury) again that was the issue." Van der Poel also sat out the beginning of last season recovering from surgery on his left knee which became inflamed after he'd returned to training following a crash in the 2015 Tour de l'Avenir had damaged his right knee. With his worrying and heavy crash at Loenhout on December 29th, where he bruised his neck, is risk taking perhaps Van der Poel's only Achilles heel? Taking risks is essential in top level cyclocross but it can also lose races. 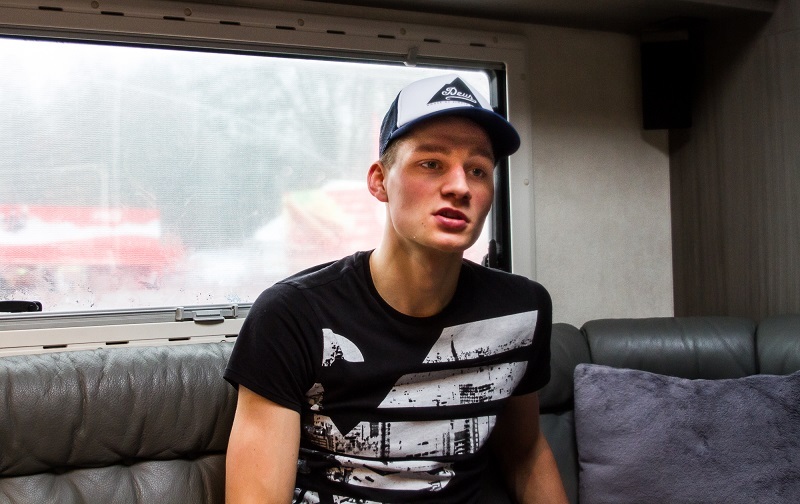 We are sat chatting before the Namur round of the UCI World Cup in the huge motorhome and travelling workshop supplied to Van der Poel and his older brother, and team mate, David by his Beobank-Corendon cyclocross team. Outside father Adrie, the 1996 World cyclocross champion, is cleaning the bikes used to reconnoitre the course and mother Corinne (daughter of French cycling legend Raymond Poulidor) is busy washing up at the kitchen sink. 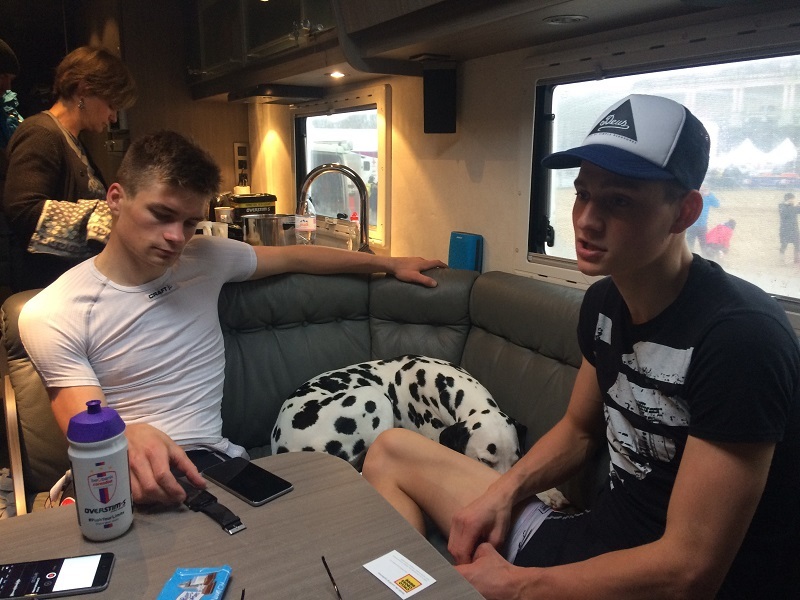 The family's Dalmation dog, Luna, relaxes between the two brothers and everything is extremely calm and normal despite this being an important double header race weekend and less than 24 hours after Mathieu's dramatic win ahead of Wout Van Aert in the Antwerp Scheldecross. On the stove I had noticed a frying pan with the remnants of pancakes (or an omelette) still stuck to it. I tentatively asked Mrs Van der Poel what today's pre-race meal is or was. "Spaghetti," she had replied. "Oh that (the dirty frying pan)! That was something for the mechanic (husband Adrie)!" Mathieu's late start to the season has put him out of real contention for two of cyclocross' big series – the UCI world Cup and the DVV Trofee. Why had he made the sandy Scheldecross such a hard race – dropping Van Aert in the final lap - when he is out of contention for the Trofee series, I asked him. "For me it's a separate race. It's not really the big picture but I'm just trying to win that race. That is the purpose for me. I want to win races whether it's for a classement (overall series) or not, that's not really important." Without Van der Poel, Wout Van Aert was able to dominate the very beginning of this season again, just like the last, with four early UCI victories (Geraardsbergen, Waterloo, CrossVegas and Iowa City) chalked up but significantly Mathieu returned at Gieten in October to beat the Belgian World champion in his first race back. In fact older brother David scored a UCI victory in America before Mathieu had started his season. David leads American Continental champion Stephen Hyde at Namur. After Mathieu's return to racing, both Van der Poel and Van Aert suffered from a series of mechanical problems which often denied fans the nail biting final lap showdown that we are becoming used to seeing and handing the other the victory. But equally there have been some thrilling races and winning moves. The pair went shoulder to shoulder quite literally in Gieten before Van Aert unshipped his chain and there have been other outstanding battles such as the Scheldecross and Namur double header in December. As this particularly dry, so far, cyclocross season progresses towards its climax and winter bites deeper I wonder if running ability will become the difference between the sport's two protagonists in the final big races? I suggest to Mathieu that this season his running appears to be just as good as Van Aert's - does he ever think he is at a disadvantage because of Van Aert's more recognised background in (cross country) running? "It's really just something that the media make out as a strong point for him, but I think when I have a good day I can run just as fast as him. He is especially very strong in the steep uphill running sections, but when it's flat, it's no problem for me to follow," Van der Poel tells me. Has he consciously gone out to improve his running? "No, no, not at all. My running is just fine," he replies, "It is just something that the media is talking about. They have a point when it is really climbing, on the really hard uphill sections he can make bigger gaps." Like Spa-Francorchamps, I suggest. "Yes something like that when it's like a wall that you have to climb, but that's not really like running on the flat particularly." Last season the pair went into the World Championship race at the Zolder motor racing circuit as joint favourites but they tangled quite literally as Van der Poel' shoe got caught in Van Aert's front spokes after a dismount on one of the severe bankings. The incident left Dutchman Lars van der Haar out front, but Van Aert hunted him down to win a last lap duel as Van der Poel failed to close the gap that he had lost. Back at Zolder for the World Cup race on Boxing Day this Kerstperiode, the mechanical hoodoos for Wout and Mathieu continued. Van Aert got off to a flying start and he was never headed extending his lead in the series. Van der Poel got off to a poor start and his chase of the World Cup leader was to be in vain, interrupted as it was by a shoe problem and then, when aiming to grab the final podium place, a front wheel puncture. He trailed in a disconsolate 14th. The slight consolation for the Dutchman is that he need not expend too much energy, mental or physical, on the two remaining World Cup races in Italy and Hoogerheide (in The Netherlands) as, after a disappointing Zolder, it's now mathematically impossible for him to beat Van Aert in that competition. Having said that, Mathieu will want to impress around his home circuit of Hoogerheide which will be seven days before the all-important world title race. Van der Poel's chances of salvaging an overall UCI World Cup podium place, after missing the first two rounds in America, were dented by the cancellation of the Koksijde round and his subsequent disappointing ride at Zolder. The Van der Poel brothers made good use of their unexpected 'day off' from racing at Koksijde in November though when they decided to ride the 200 kilometres to their home (east of Antwerp), albeit with a terrific tailwind, instead of ride in the motorhome. Whilst Mathieu receives most of the attention he is careful to credit his older brother David - as a team mate and training partner as well as brother - who by all accounts makes him work hard in training. "It was his idea," jokes Mathieu. "He gets the credit for it!" David immediately counters in the way that brothers (and close friends) do. How did they navigate over such a long distance? "First we set it in the GPS but it was taking us on all the little small roads. We knew which general direction we had to go so we looked at the phone from time to time and with a bit of searching it worked," explained David. So it was an enjoyable day? "Yes, it was with wind in the back!" adds Mathieu. "We had a good training and were set up for the next week. We turned what could have been a lost day into a good day of training." All countries seem to like a rivalry with their neighbours and Belgium and The Netherlands are no different. At the Namur World Cup in December, a merry Belgian fan was stood in front of me on the spectacular, off camber and rutted descent. "Hollander" he hollered, in a confrontational tone, at Van der Poel before then turning his disdain, bizarrely, on his own countryman Sven Nys who was observing the race nearby – "The - Nysss!" After one too many Jupilers, this fan was clearly a slightly confused man. Yet despite the national rivalry, the Van der Poel family live just inside Belgium in the twisting border country where it's difficult to tell which of the two Lowland countries you are actually in. They ride, like many pro riders in the area, continually crossing the contorted national boundary. A Dutch person from the north of The Netherlands, who have the distinctive 'High Dutch' accent, might even say they are 'Dutch with a Belgian accent'! Van der Poel tells us that he is very happy that the fans come out, in all weathers, to (help financially) support the sport. He is asked about the 'pretty crazy atmosphere' of a big Belgian cross. "It's good that there are lots of fans and it's nice to be rider in such a big crowd. It gives you a certain amount of adrenaline to go further and beyond your limits. It's part of cyclocross, you hear it, but you are focused on the track." This season Van der Poel appears to be the only real Dutch hope for the World title as Lars van der Haar has missed so many weeks of racing with injury. Van der Haar returned to racing at Zolder where he was 31st following a hamstring injury. Dutch roadie and former World 'cross champion Lars Boom was 11th in Zolder and 2nd in Surhuisterveen (on January 4th) and also plans to race the remaining World Cup races. The closest rivals to Van der Poel and Van Aert this season seem to be Tom Meeusen and Kevin Pauwels with Laurens Sweeck, Michael Vanthourenhout and Toon Aerts occasionally in the mix, but any of those winning the World title on January 29th would come as a big surprise. Back in 2013 the European Championships in Mladá Boleslav were a waterlogged slugfest and in the Under-23 race Belgians Van Aert, Gianni Vermeersch and Michael Vanthourenhout appeared to be physically ganging up on Van der Poel. Vanthourenhout won the race by 23 seconds with Van der Poel second ahead of Vermeersch and then Van Aert. Can Mathieu offer any explanation why Vanthourenhout does not seem to have made the same progression as the Van Aert and himself since then? "I don't know. This season is not what I expected from him, I expected him to be better," says Mathieu, "In the beginning of the season he had some really good races but he then seems to have had difficulties to maintain his form. I expected more from him." At the very end of our half an hour in the Van der Poel motorhome another journalist asks the oft repeated question: "Are you looking to switch to road racing as you've mentioned before?" Van der Poel appears less comfortable with this question, but that's not necessarily surprising given that we are in the midst of a thrilling 'cross season. "Erm, I said I was going to go to the road definitely, but I said it would be when it was a good time to go - perhaps at the end of 2018," Mathieu states. "But for now I enjoy cyclocross much more and I don't have the feeling to go to the road. I can have more fun in the woods when it's raining for instance and it's better than having to always go for a long ride on the road!" This season's World Championships are hosted by Luxembourg for the first time since 1968. The course in Bieles (which has played host to big races in the past) is a bit of an unknown quantity for practically all the riders, so what does Mathieu know about the course for the season's big climax and will he see it before the championship weekend? "No, I haven't been there. I've received some photos and so I have a picture of what it's like but you never know until you ride on the course. Besides the conditions can really change over the weekend anyway so it's not really necessary to go." It's going to be a fascinating World Championship contest on January 29th and, as usual, a very difficult one to predict. With two riders so evenly matched it could come down to who makes the fewest mistakes - at least I hope that is the case - rather than who suffers the most mechanical problems! One thing is for sure though, both Van der Poel and Van Aert start as clear favourites to retain the titles in their respective National Championships this coming Sunday (January 8th).